While feline asthma has not been a common problem in the past, more cats are developing the condition due to pollution and other environmental toxins. Learn about the symptoms, so you can determine if your cat needs to see the vet to be assessed and treated for asthma. Asthma in cats is very similar to asthma in humans. It is a condition in which the lungs' airways are constricted, and this makes it difficult to breathe. This might occur due to an allergic reaction, stress or for no apparent reason at all. Asthma in both cats and humans tends to follow a pattern. First, excess mucus forms, and the airway walls swell. This is followed by spasms that cause these airways to tighten up and make breathing more difficult. The asthmatic can't draw a deep breath, and labored breathing is accompanied by wheezing. Coughing also accompanies an attack. Most movement will be impossible because breathing is such an effort. A chronic cough may be the only sign of this condition until a severe episode of constriction happens. If your cat seems to cough a lot, it would be a good idea to discuss the possibility of feline asthma with your vet. There are a number of symptoms that you can look for if you think your cat might have asthma. Some of these are very apparent while others are more subtle. 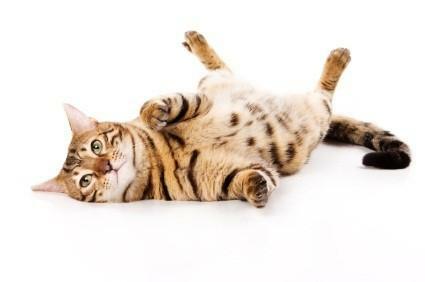 It is important to know what is normal for your cat so that you can immediately see any changes in your pet's health. Your vet will want to examine your cat carefully if he suspects feline asthma. The first step is to take a radiograph of the chest while the cat actively experiences breathing difficulties. If your cat is having an asthma attack, the radiograph will show that there are pockets of trapped air in your cat's lungs that can't be exhaled due to constriction of the airways. It may also show thickening of the walls of the airways that your vet will term "donuts" and "tramlines" depending on where they are and how he views them. These findings will point to asthma.Not all asthmatic cats have obvious physical changes show up in the radiograph. If your vet doesn't find anything unusual in your pet's lungs, he will likely want to perform other tests. One of these may be a bronchoscopy. This is the process of taking cells from the lower respiratory tract in order to test and study them. The mucus of an asthmatic typically contains eosinophil in large quantities. If eosinophil is found, and the potential for parasites like lungworm and heartworm has been ruled out, the vet can be more confident in his diagnosis. Finally, your vet may diagnosis feline asthma by how your pet responds to treatment. If your pet is having an acute asthma attack. your vet may give her a small dose of epinephrine or an airway dilator like terbutaline. Symptoms should go away in as little as 15 minutes. Since the problem created by asthma is inflammation of the airways, corticosteroid medications are an important part of the treatment plan. Your vet may prescribe a medication like Prednisone or DEPO-MEDROL. These medications may be given orally, by injection or by an inhaler. The medication is not a cure for the feline asthma, but it can help keep it under control and allow your cat to have a normal life. Many of these side-effects occur with high doses of the medications and will resolve themselves as the medication level is lowered over time. If your pet has feline asthma, it is not the end of the world. Try to keep her environment as clean and chemical-free as possible, and feed organic cat food when you can. Follow your vet's instructions carefully and continue the medications according to directions. This will give your cat the best chance at a long, normal life.